The Spanish Empire, once the most powerful in the world, was also one of the first to disintegrate. Nationalist movements emerged across Central and South America, often led by men who were themselves, at least partially, of Spanish descent. Mexico became independent in 1821. It was one thing, however, to declare the existence of a new state, to adopt a constitution and elect a president; it was quite another to create a functioning society among a people riven by divisions based on class, ethnicity and language. Democracy soon gave way to dictatorship, and peace to war, as Mexico fought for its existence, first with the Americans, and then with the French. The dictatorship of Porfirio Diaz (1876-1911) delivered some measure of stability, economic modernisation and growth, but, whilst foreign investors, and a small elite of Mexican land-owners, profited from the country's rich mineral reserves, the vast majority of the population languished in grinding poverty. Diaz was forced from power in 1911 by a loose coalition of constitutionalist liberals and idealistic radicals, but this coalition broke down into factionalism and civil war as promised land reforms came to nothing and the status quo seemed obstinately to endure. 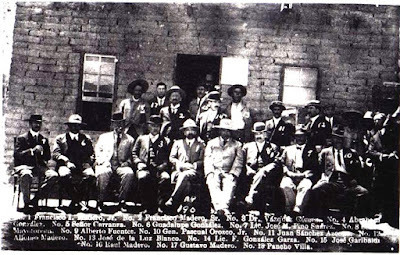 Mexican revolutionary leaders gather for a group photograph in 1911, having forced Diaz from office, but they would soon be fighting one another over different visions of the nation's future (image is in the Public Domain). The Mexican Revolution, unlike the French and Russian Revolutions, did not have a single unifying ideology or philosophy: villagers rose up against the local elites that oppressed them, a conflict between los de abajo (those from below) and los de arriba (those from above), driven by charismatic leaders such as Francisco ("Pancho") Villa and Emiliano Zapata, who seemed to embody the hope for a better future, however vaguely defined. Ultimately, it would fail, but the legend of those who had dared to challenge power endured to inspire new revolutionary movements around the world. 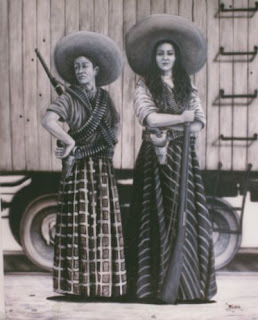 "Las Adelitas" - women fought alongside men in the Mexican Revolution (image is in the Public Domain). 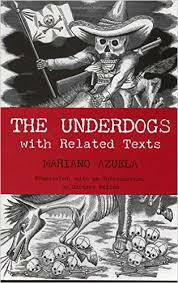 The Underdogs, Mariano Azuela's novel of the Mexican Revolution, was published in Spanish (as Los de Abajo) in 1915. 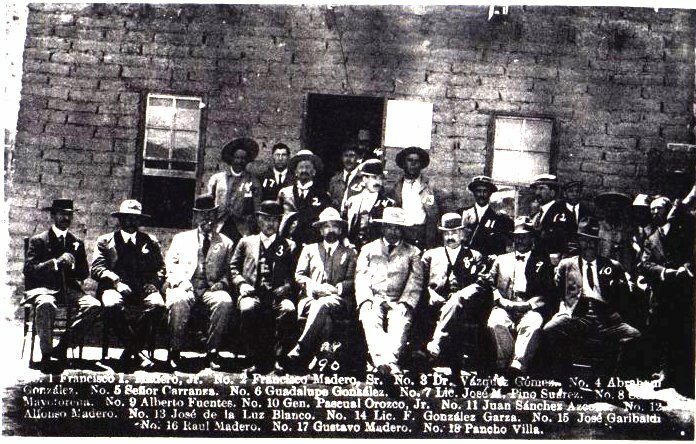 Azuela himself had been a participant in the revolution, as medical officer in the army of Julian Medina, one of Pancho Villa's generals. Like Balzac's Les Chouans (which Azuela had surely read), the novel begins and ends in medias res. Azuela's novel follows a specific band, led by a fictional revolutionary commander, Demetrio Macias, as they experience both victory and defeat. A humane and observant medic, Azuela seems independently to have reached the same conclusion as the psychiatrist, W.H.R. Rivers, treating soldiers from the Western Front, that soldiers in battle are motivated less by patriotism or abstract ideals, than by their personal loyalty to those fighting alongside them. It is these relationships between compadres, rather than any grand narrative of the revolution and its ideals, that form the basis of the novel, and make it such a powerful depiction of a specific moment in time and space. "'It's not an animal ... Just hear Palomo bark ... It's got to be a person.' The woman's eyes searched the darkness of the sierra. 'Maybe Federales,' answered the man who squatted, eating in a corner, a clay pot in his right hand and three rolled tortillas in the other. The woman did not answer; her senses were concentrated outside the hut. They heard the sound of hooves in the nearby gravel, and Palomo barked more furiously. 'You should hide just in case, Demetrio.' Calmly, the man finished eating, grabbed a cantaro, and lifting it with both hands, drank water in gulps. Then he stood. 'Your rifle is under the mat,' she whispered. The small room was lit by a tallow candle. A yoke, a plow, a goad and other farming tools rested in a corner. From the roof hung ropes holding up an old adobe mold that served as a bed, and on blankets and faded rags a child slept. Demetrio buckled on the cartridge belt and picked up the rifle ... He walked out slowly, fading into the impenetrable darkness of the night ... The moon peopled the mountain with vague shadows. At every ridge and every bush, Demetrio saw the sad silhouette of a woman with a child in her arms. After many hours of climbing when he turned to look, at the bottom of the canyon near the river, huge flames rose. 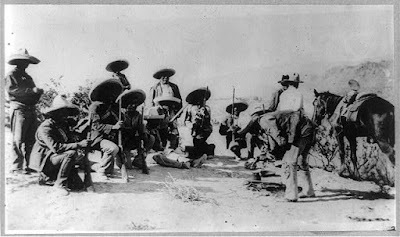 His house was burning ..."
A Mexican rebel camp near Juarez, 1911 (image is in the Public Domain). "'And what do you want us to do with the curro I caught last night?' Pancracio asked. 'That's right! ... I forgot!' Demetrio, as always, thought and hesitated a good deal before making a decision. 'Let's see Codorniz, come over here. Look, ask about a chapel that is about three leagues from here. Go and steal the cassock from the priest.' 'But what are we going to do, compadre?' Anastasio asked stunned. 'If this curro has come to murder me, it's easy to get the truth out of him. I tell him I'm going to have him shot. Codorniz dresses up as a priest and hears his confession. If he has sinned, I shoot him; if not, I let him go.'" Pancho Villa entering Ojinaya, Mexican National Archive (image is in the Public Domain). "'Here comes Villa!' The news spread with the speed of lightning. Ah, Villa! ... the magic word. The great man appears; the unvanquished warrior who even from a distance can charm like a boa. 'Our Mexican Napoleon!' exclaims Luis Cervantes ... Villa is the indomitable lord of the sierra, the eternal victim of all governments who hunt him like a beast. Villa is the reincarnation of the old legend: the providential bandit, who passes through the world with the luminous torch of an ideal: steal from the rich and make the poor rich! And the poor turn him into a legend that time will embellish so that it will live on from generation to generation." I don't think my Spanish is up to reading the original, but have to add this to my To Read list (below yours of course). Studied Zapata and the Revolution many decades ago and very interested even now. Spanish blood in my veins/genes. My Spanish certainly isn't up to reading the original, but this translation does seem to flow, and there are some fascinating historical documents attached.